Whether it’s because you’re about to start a day full of shopping, you’ve been exploring one of the local parks, or you’re simply looking to sit back and relax after spending a day in the Bethesda Row area, there are plenty of reasons to dine at one of Bethesda Row’s restaurants. No matter what time or day of the week, there’s always something great to choose from since Bethesda Row has some of the best restaurants in Bethesda. If you’re looking for a great date night spot, need a quick breakfast on the go, or you’re looking to try something new, here are a few Bethesda Row restaurants you won’t want to miss! Looking to add some spice to your next meal? Tandoori Nights is an upscale contemporary Indian restaurant that serves modern Indian cuisine. With an emphasis on healthy yet high-quality food, Tandoori Nights brings you the best of both worlds: diet-friendly meals with a lot of flavor. The menu also offers many vegetarian options. Check out Tandoori Night’s entire menu here! Monday – Friday: 11:30 a.m. – 2:30 p.m.
Saturday: 11:30 a.m. – 4:00 p.m.
Sunday: 11:30 a.m. – 4:00 p.m.
Friday: 5:00 p.m. – 11:00 p.m.
Saturday: 4:00 p.m. – 11:00 p.m. Sometimes you might be craving something that’s on the lighter side or need a light snack in-between stores. Raku might have just what you’re looking for. Offering gourmet Japanese cuisines such as sushi, sashimi assortments, light salads, and savory curry broths, Raku has a little bit of something for everyone and every appetite. 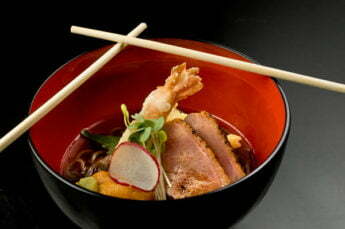 Raku even has an online ordering service, so if you’re in a hurry you can quickly order your food and be on your way! Here’s where you can look over their menu. Monday – Friday: 11:30 a.m. – 2:30 a.m.
Sunday: 11:30 p.m. – 3:00 p.m.
Friday & Saturday: 5:00 p.m. – 10:30 p.m.
Who doesn’t love fresh lobster? Luke’s Lobster is the place you want to go when you’re looking for the best lobster in Bethesda Row. Luke’s Lobster works directly with fishermen to hand pick the highest quality seafood and bring it to directly to their restaurants. Although they’re best known for their Maine-style lobster rolls, Luke’s Lobster in Bethesda Row also offers savory bisques and fresh salads on their menus. And don’t forget to check out their outdoor patio if you’re looking to relax and enjoy some warm weather! Monday – Sunday: 11:00 a.m. – 9:00 p.m. Happy Hour: Monday – Sunday 4:00 p.m. – 7:00 p.m.
Nestled in the heart of Bethesda Row, Mon Ami Gabi is a charming and bustling French bistro and steakhouse. Offering everything from gourmet salads to pristine prime rib beef, Mon Ami Gabi is a local favorite in Bethesda Row. 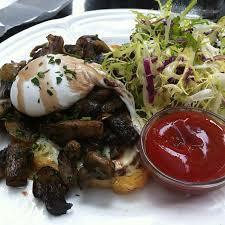 The restaurant also offers vegetarian options and even has a completely gluten-free menu. Make sure to check this place out on Tuesdays or Thursdays when they have live jazz bands, or on the weekends when they offer their brunch menu! Discover Mon Ami Gabi’s full menus here. 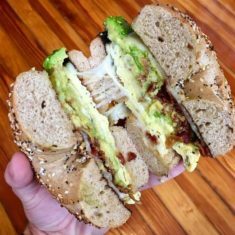 Monday – Thursday: 11:30 a.m. – 10:00 p.m.
Friday: 11:30 a.m. – 11:00 p.m.
Offering some of the best bagels in the Bethesda area, Bethesda Bagels is the perfect spot for a quick morning breakfast or even an early lunch if you’re in the Bethesda Row area. But don’t let the name fool you – although Bethesda Bagels has an extensive and delicious variety of bagels, they also have sandwiches, soups, and even NY-style pizza! Check out their extensive menu here. Monday – Saturday: 6:30 a.m. – 5:00 p.m. Le Pain Quotidien is passionate about providing diners with wholesome, quality food. With it’s warm and welcoming setting, guests are able to relax and take a breather from their busy days while enjoying the savory smells of the bakery. Meaning ‘the daily bread’ in French, Le Pain Quotidien also prepares fresh, organic bread every day and offers healthy and hearty meals all day. Check out their wholesome and sustainable menu here. Monday – Sunday: 7:00 a.m. – 8:00 p.m.
Offering excellent made-from-scratch comfort food and specialty dishes in a bistro environment, Cafe Deluxe is a place everyone can love in Bethesda Row. Whether you’re there to enjoy their Creole-inspired meatloaf, or you want to snack on some appetizers, Cafe Deluxe will have what you’re looking for whether you’re starting or ending your day in Bethesda Row. You can check out Cafe Deluxe’s mouth-watering menu here – they even have a dedicated gluten-free menu, too! Monday – Thursday: 11:30 a.m. – 9:00 p.m.
Saturday: 10:30 a.m. – 10:00 p.m.
Sunday: 10:30 a.m. – 8:00 p.m.
Save some room for dessert? Look no further than Dolcezza Gelato! Producing hand-made gelato every day, Dolcezza Gelato is the place to be when your sweet tooth takes over. Not craving the sweets? Dolcezza Gelato also offers gourmet coffee and iced coffee for those mornings when you’re on the go. Monday – Thursday: 7:00 a.m. – 10:00 p.m.
Friday: 7:00 a.m. – 11:00 p.m.
Saturday: 8:00 a.m. – 11:00 p.m.
Last, but certainly not least, on our list of Bethesda Row restaurants you don’t want to miss is none other than Georgetown Cupcake. 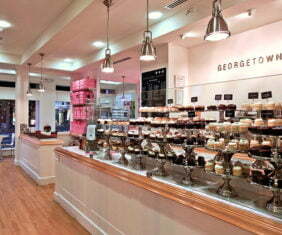 Founded in the neighborhood of Georgetown, Washington D.C., Georgetown Cupcake opened its second shop in Bethesda Row. Providing delicious, gourmet, and hand-crafted cupcakes, Georgetown Cupcake is the place to go next time you need a batch of treats. Check out their jaw-dropping menu here. Sunday: 10:00 a.m. – 8:00 a.m.
And don’t forget about Bethesda Row’s shops! Here are all the places you don’t want to miss when you go on your next shopping spree in Bethesda Row.